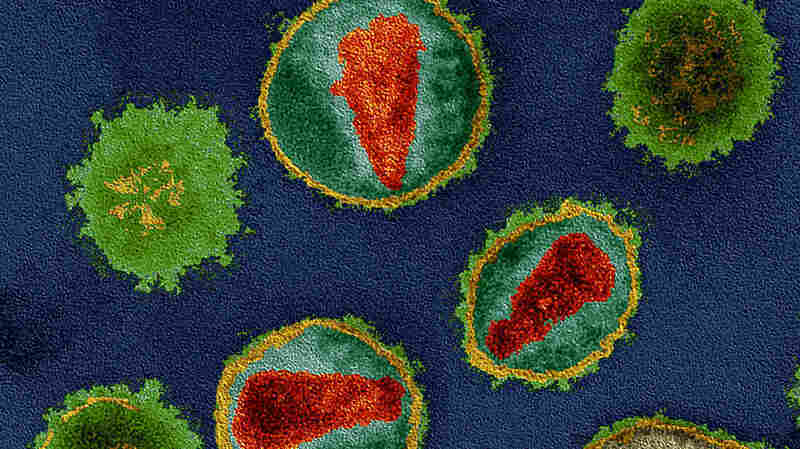 Is HIV Evolving Into A Weaker Virus? : Goats and Soda In parts of southern Africa, HIV has picked up mutations that slow down its ability to grow inside a person's blood. That's a good sign. But will it be enough to make a difference in the epidemic? HIV is like a jack-in-the-box: When it binds to a cell, its shell (yellow) pops open, and its genetic material (reds) comes out. Viruses are masters at mutating. So the big concern with deadly viruses, like Ebola and hepatitis C, is that they will evolve into more dangerous forms over time. It looks like just the opposite is happening with HIV — although it's happening slowly. "HIV can generate any mutation in the book, on any day," says virologist Philip Goulder at the University of Oxford. Over a 10-year period, HIV has picked up mutations that make it slightly less virulent in parts of southern Africa, Goulder and his team reported Monday in the Proceedings of the National Academy of Sciences. That means it could take a little longer for some people to develop AIDS if they don't get HIV treatment. The mutations push back the average time to develop AIDS in Botswana from about 10 years to about 12.5 years, Goulder says. "It doesn't sound like a big deal," he says. "But those changes in the virus occurred in just 10 years. If we roll forward a few decades, the evolution of the virus could have a massive effect. We'll have to see if the trend continues." Right now, though, HIV is still deadly and dangerous, Goulder is quick to point out. "Although these findings are good news and a step in right direction," he says, "it may be decades, even centuries, before HIV stops causing AIDS. That's a long, long way down stream." To figure out how HIV has changed over time, Goulder and his team sequenced the virus' genes from about 2,000 women in Botswana and South Africa. The HIV epidemic started in Botswana about a decade earlier than in South Africa. During those extra 10 years, the virus picked up mutations that help it evade the human immune system. That sounds like a bad sign. But those mutations came at a cost for the virus, Goulder says: "They crippled HIV." The mutations picked up in Botswana slightly slow down the speed at which the virus replicates inside a person's blood, Goulder and his team found. The speed drop by about 10 percent, on average. 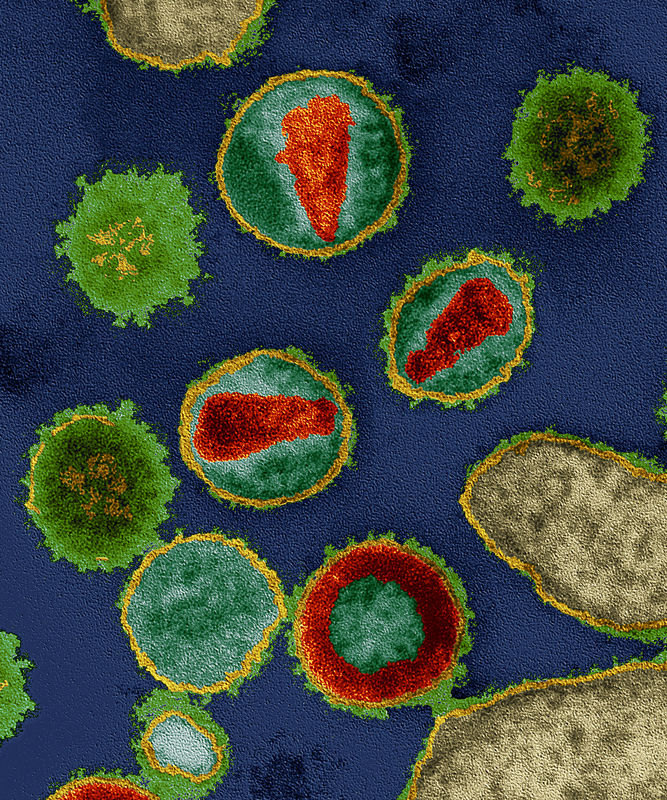 That small slowdown could make a difference in whether someone's immune system can control the virus or not, says virologist Todd Allen of the Ragon Institute in Cambridge, Mass. "A small effect like that could have a substantial clinical impact," says Allen, who wasn't involved in the study. "The effect gets magnified because it occurs every time the virus replicates." Scientists have observed these same crippling mutations in HIV for years inside the lab, Allen says. But this study demonstrates that this evolution happens outside the lab and on a larger scale. "It's the first time scientists have really shown that HIV is slowly losing its oomph on a population level," he says. The findings, Allen says, also offer new clues for developing an HIV vaccine — a task that's been fraught with failure. "This study adds to the understanding of what's required to control HIV," he says. "It highlights the parts of the virus that we should be targeting to start crippling HIV with new drugs or even a vaccine." Those clues, he says, may prove more important for ending HIV than the natural evolution of the virus.